Avian influenza is a slightly misleading term, as influenza is among the natural infections found in birds. The term avian influenza used in this context refers to zoonotic human infection with an influenza strain that primarily affects birds. Influenza virus is an orthomyxovirus—an enveloped, segmented, negative-sense RNA virus. Influenza virus has 3 strains—A, B, and C. (For additional information on influenza, see Medscape's Influenza Resource Center.) Avian influenza is caused by influenza A virus, which has 8 RNA segments. Avian influenza is a potential and unpredictable threat to humans because of the segmented nature of the genome. These serotypic differences result in much of the species specificity due to differences in the receptor usage (specifically sialic acid, which binds to hemagglutinin and which is cleaved by neuraminidase when the virus exits the cell). The immune response to these antigens is responsible for most host protection. The viral RNA polymerase lacks error-checking mechanisms and, as such, the antigenic drift from year to year is sufficient to ensure a significant susceptible host population. However, the segmented genome also has the potential to allow re-assortment of genome segments from different strains of influenza in a co-infected host. Although all strains of influenza A virus naturally infect birds, certain strains can infect mammalian hosts such as pigs and humans. The re-assortment of an avian strain with a mammalian strain may produce a chimeric virus that is transmissible between mammals; such mutation products may contain hemagglutinin and/or neuraminidase proteins that are unrecognizable to the immune systems of mammals. This antigenic shift results in a much greater population of susceptible individuals in whom more severe disease is possible. Such an antigenic shift can cause a pandemic, 4 of which have occurred in recorded history. The most striking pandemic occurred in 1918, when the Spanish influenza (H1N1) resulted in approximately 50 million deaths worldwide. Others included the pandemics of 1957 (H2N2) and 1968 (H3N2); smaller outbreaks occurred in 1947, 1976, and 1977. The fact that H3N2 is still circulating without causing an ongoing pandemic highlights the importance of herd immunity. The most recent pandemic was in 2009, caused by a swine-origin influenza of the H1N1 serotype. Avian influenza has low-pathogenic (LPAI) and highly pathogenic (HPAI) strains. H5N1 is typically a highly pathogenic virus in birds, resulting in severe disease and death. This strain has drawn more attention than other HPAI strains because of ongoing reports of bird-to-human transmissions that result in severe disease in the human host. Recently, some evidence has indicated that H5N1 may cause fewer symptoms in ducks, making them a potential reservoir for infection and spread by migratory flocks. A reassorted H5N1 virus has been reported in the United States among wild birds but is not considered a threat to humans. Several confirmed cases of human infection with LPAI strains (H7N2 in the United Kingdom and the US states of Virginia and New York; H7N7 in the Netherlands, H9N2 in China and Hong Kong) have been reported. In 2004, one outbreak of an HPAI H7N3 in Canada resulted in mild human disease. In early 2009, a recombinant H1N1 influenza consisting of a mix of swine, avian, and human gene segments spread rapidly around the world, but it was a low-pathogenicity strain. H5N1 was first reported to cause severe human disease in 1997 in an outbreak among infected chickens on Hong Kong Island. The outbreak was successfully contained with the slaughter of the entire local chicken population (around 1.5 million birds). However, 18 human cases were reported, of which 6 resulted in death. Since then, H5N1 has been found in chickens, ducks, and migratory fowl throughout Asia and is now spreading west through Europe and North Africa. Human cases are following the route of the avian spread, but H5N1 has also been found in dead birds in several countries without any reported human cases  (eg, the United Kingdom, Germany; see image below). 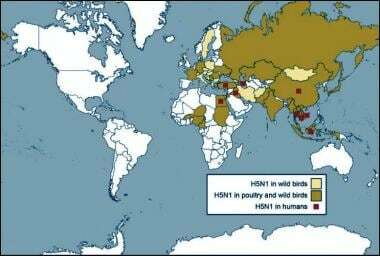 Global map of countries where avian influenza (bird and human infections) has been reported. Image courtesy of PandemicFlu.gov. The latest H7N9 outbreak started in China in 2013 and was initially described in 126 people. Smaller numbers of cases have been reported since, mostly involving direct contact with domestic birds. To date, the H7N9 has spread in the poultry population across China, resulting in more than 1500 reported human reported human infections. One case was imported to Canada in January 2014. Although this results in a more severe respiratory infection, it probably explains why few, if any, definite human-to-human transmissions of avian influenza have been reported; infection of the upper airways is probably required for efficient spread via coughing and sneezing. Many are concerned that subtle mutation of the hemagglutinin protein through antigenic drift will result in a virus capable of binding to upper and lower respiratory epithelium. The 1918 pandemic strain was so lethal partially because the receptor utilization of the hemagglutinin differed from that of other strains, and H5N1 has that potential to acquire that same biology through mutation. Differences in the PA, NP, M1, NS1, and PB2 genes tend to correlate with human strains of influenza, including human infections with avian influenza. The functional role of these genetic markers has yet to be determined but likely involves replication enhancement and immune suppression. Unlike with human influenza, most deaths associated with avian influenza have been due to primary viral pneumonia, with no evidence of secondary bacterial infection. Normal influenza results in approximately 200,000 hospitalizations and 36,000 deaths annually in the United States, with the peak season in the winter months. However, no cases of avian influenza in humans have been reported in the United States although avian influenza has been identified in some wild birds in a few states in the US in 2014 and 2015. As of August 27, 2015, 844 cases of H5N1 had been reported worldwide, with 449 deaths. Most cases have been in eastern Asia; some cases have been reported in Eastern Europe and North Africa. Underreporting has been a concern, particularly in China, but the prevailing attitude about the need to suspect, test, and report cases of avian influenza is growing. There have been 631 reported cases of H7N9 influenza, mostly from China, with other cases in Taiwan, Malaysia, Hong Kong, and Canada (2 imported cases). The image below depicts the countries where avian influenza has been reported. The extraordinarily high mortality rate of avian influenza (>60% for H5N1; approximately 30% for H7N9) is worrying and reasonably accurate. There have been very few instances of seropositive individuals without clinical signs of infection. In most instances, the policy is to test exposed individuals around an outbreak (human and avian). Therefore, a large population of exposed but untested people is unlikely. Race appears to be a factor only to the extent that geographic differences in the rate of HPAI among birds and the degree of bird-to-human contact are significant. In Egypt, 90% of fatalities due to avian influenza have involved women, a pattern that has not been readily apparent elsewhere. Most cases of H7N9 have been reported in men. Avian influenza has the highest case-fatality rate among persons aged 10-39 years. Unlike seasonal influenza, which disproportionately affects very young and very old individuals, young adults make up a large proportion of the avian influenza cases. Fifty percent of reported cases have been in people younger than 20 years. Forty percent of cases involve persons aged 20-40 years. The prognosis of confirmed human cases of avian influenza is related to the degree and duration of hypoxemia. The cases to date have exhibited a 60% mortality rate. The risk of mortality depends on the degree of respiratory disease rather than the bacterial complications (pneumonia). Little evidence regarding the long-term effects of disease among survivors is available. Tanner WD, Toth DJ, Gundlapalli AV. The pandemic potential of avian influenza A(H7N9) virus: a review. Epidemiol Infect. 2015 Dec. 143 (16):3359-74. [Medline]. Hulse-Post DJ, Sturm-Ramirez KM, Humberd J, Seiler P, Govorkova EA, Krauss S, et al. Role of domestic ducks in the propagation and biological evolution of highly pathogenic H5N1 influenza viruses in Asia. Proc Natl Acad Sci U S A. 2005 Jul 26. 102 (30):10682-7. [Medline]. World Health Organization. H5N1 avian influenza: Timeline of major events. World Health Organization. Available at http://www.who.int/csr/disease/avian_influenza/Timeline_2007_03_20.pdf. Accessed: October 2007. Kayali G, Kandeil A, El-Shesheny R, Kayed AS, Maatouq AM, Cai Z, et al. Avian Influenza A(H5N1) Virus in Egypt. Emerg Infect Dis. 2016 Mar. 22 (3):379-88. [Medline]. [Full Text]. World Health Organization. Influenza (Avian and other zoonotic). WHO. Available at https://www.who.int/news-room/fact-sheets/detail/influenza-(avian-and-other-zoonotic). November 13, 2018; Accessed: April 8, 2019. Ungchusak K, Auewarakul P, Dowell SF, Kitphati R, Auwanit W, Puthavathana P, et al. Probable person-to-person transmission of avian influenza A (H5N1). N Engl J Med. 2005 Jan 27. 352 (4):333-40. [Medline]. Hoheisel G, Luk WK, Winkler J, Wirtz H, Gillissen A, Hui DS, et al. [Avian influenza and the Severe Acute Respiratory Syndrome (SARS) - experiences and perspectives]. Pneumologie. 2007 Jan. 61 (1):41-5. [Medline]. Nicholls JM, Chan MC, Chan WY, Wong HK, Cheung CY, Kwong DL, et al. Tropism of avian influenza A (H5N1) in the upper and lower respiratory tract. Nat Med. 2007 Feb. 13 (2):147-9. [Medline]. Chen GW, Chang SC, Mok CK, Lo YL, Kung YN, Huang JH, et al. Genomic signatures of human versus avian influenza A viruses. Emerg Infect Dis. 2006 Sep. 12 (9):1353-60. [Medline]. Centers for Disease Control and Prevention. Key Facts About Seasonal Influenza (Flu). Centers for Disease Control and Prevention. Available at http://www.cdc.gov/flu/keyfacts.htm. Accessed: October 2007. World Health Organization. Confirmed Human Cases of Avian Influenza A(H5N1). World Health Organization. Available at http://wpro.who.int/emerging_diseases/AvianInfluenza/en. Accessed: August 2015. Kato YS, Fukui K, Suzuki K. Mechanism of a Mutation in Non-Structural Protein 1 Inducing High Pathogenicity of Avian Influenza Virus H5N1. Protein Pept Lett. 2016. 23 (4):372-8. [Medline]. Dudley JP. Age-specific infection and death rates for human A(H5N1) avian influenza in Egypt. Euro Surveill. 2009 May 7. 14 (18):[Medline]. World Health Organization. Clinical management of human infection with avian influenza A (H5N1) virus. Available at. World Health Organization. Available at http://www.who.int/influenza/resources/documents/ClinicalManagement07.pdf. Accessed: August 2015. Taniguchi K, Ando Y, Nobori H, Toba S, Noshi T, Kobayashi M, et al. Inhibition of avian-origin influenza A(H7N9) virus by the novel cap-dependent endonuclease inhibitor baloxavir marboxil. Sci Rep. 2019 Mar 5. 9 (1):3466. [Medline]. US Food and Drug Administration. H5N1 Influenza Virus Vaccine. US Food and Drug Administration. Available at http://www.fda.gov/biologicsbloodvaccines/vaccines/questionsaboutvaccines/ucm080753.htm. Accessed: August 2015. Belshe RB, Frey SE, Graham I, Mulligan MJ, Edupuganti S, Jackson LA, et al. Safety and immunogenicity of influenza A H5 subunit vaccines: effect of vaccine schedule and antigenic variant. J Infect Dis. 2011 Mar 1. 203 (5):666-73. [Medline]. Centers for Disease Control and Prevention. Interim Guidance on the Use of Antiviral Medications for Treatment of Human Infections with Novel Influenza A Viruses Associated with Severe Human Disease. Centers for Disease Control and Prevention. Available at http://www.cdc.gov/flu/avianflu/novel-av-treatment-guidance.htm. Accessed: August 2015. Hill G, Cihlar T, Oo C, Ho ES, Prior K, Wiltshire H, et al. The anti-influenza drug oseltamivir exhibits low potential to induce pharmacokinetic drug interactions via renal secretion-correlation of in vivo and in vitro studies. Drug Metab Dispos. 2002 Jan. 30 (1):13-9. [Medline]. Auewarakul P, Suptawiwat O, Kongchanagul A, Sangma C, Suzuki Y, Ungchusak K, et al. An avian influenza H5N1 virus that binds to a human-type receptor. J Virol. 2007 Sep. 81 (18):9950-5. [Medline]. Beigel JH, Farrar J, Han AM, Hayden FG, Hyer R, de Jong MD, et al. Avian influenza A (H5N1) infection in humans. N Engl J Med. 2005 Sep 29. 353 (13):1374-85. [Medline]. Chen H, Smith GJ, Zhang SY, Qin K, Wang J, Li KS, et al. Avian flu: H5N1 virus outbreak in migratory waterfowl. Nature. 2005 Jul 14. 436 (7048):191-2. [Medline]. Finkelstein DB, Mukatira S, Mehta PK, Obenauer JC, Su X, Webster RG, et al. Persistent host markers in pandemic and H5N1 influenza viruses. J Virol. 2007 Oct. 81 (19):10292-9. [Medline]. Shi D, Yang J, Yang D, LeCluyse EL, Black C, You L, et al. Anti-influenza prodrug oseltamivir is activated by carboxylesterase human carboxylesterase 1, and the activation is inhibited by antiplatelet agent clopidogrel. J Pharmacol Exp Ther. 2006 Dec. 319 (3):1477-84. [Medline].